Perhaps Sturdivan should have studied geometry as well as ballistics. An ellipse is a symmetrical shape, so if the entrance hole was truly an ellipse not only could it be made by a non-yawing bullet striking at a tangent, it could only be made such a bullet. A yawing or tumbling bullet will make an entrance wound that looks anything from the side of the bullet to an egg shape which could be similar to an ellipse but not an ellipse because it is not symmetrical. An elliptical entrance wound that was twice as long as it was wide would be made by a bullet oriented in the direction of travel striking at a 60 degree angle to the perpendicular from the surface at the point of impact. Who says that such a wound would not penetrate? The skin and soft tissue is not going to deflect it. Bone might but if it hit at a 60 degree angle on the fifth rib, it is more likely that the bullet would push on the rib until the rib either moved out of the way or until the bullet penetrated the bone. How does a bullet that is 3 cm in length create a hole that in 3 cm in length if not by entering fully sideon? Olivier himself acknowledged that the only other possible explanation for a wound being 3 cm in length is if it was a tangential wound. Meaning a glancing, non-penetrating, wound. Sturdivan knew what he was talking about. He still does. How does a bullet that is 3 cm in length create a hole that in 3 cm in length if not by entering fully sideon? "Dr. SHAW. This was a small wound approximately a centimeter and a half in its greatest diameter. It was roughly elliptical. It was just medial to the axilliary fold or the crease of the armpit, but we could tell that this wound, the depth of the wound, had not penetrated the shoulder blade." 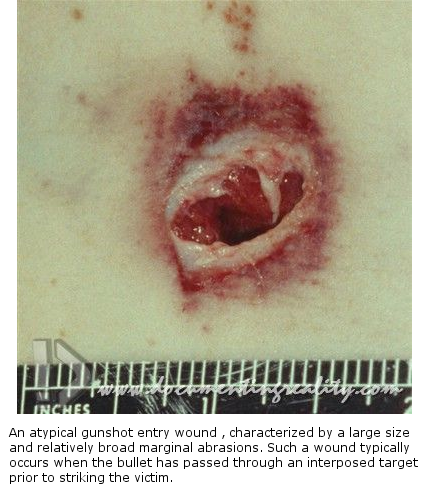 Such a wound can only be created by a non-yawing 6.5mm bullet (its long axis aligned with its direction of motion) striking at an angle. If the bullet hit sideways, it would look like the bullet profile and would not tunnel into the underlying tissue with a nice round hole. Olivier himself acknowledged that the only other possible explanation for a wound being 3 cm in length is if it was a tangential wound. Meaning a glancing, non-penetrating, wound. Olivier never said that it was a "glancing, non-penetrating, wound". Olivier referred to the entrance wound being caused by a "tangential" strike he was obviously aware that the bullet that made that entrance wound had penetrated Gov. Connally's chest. He was using "tangential" in the sense of "large angle" (an angle with a "large tangent"). How can a wound at 60 degrees be "non-penetrating"? The only way it could not penetrate would be if it was deflected. What is going to deflect it and prevent it from just plowing through in the same direction it was travelling before it entered? Are you saying that Dr. Olivier did not know what he was talking about? Can you cite your source for a bullet leaving the M-C at 2,100 f.p.s.? Can you cite any evidence that shows the back wound and throat wound were *connected*? from Bill Kelly's blog (JFKCountercoup)..
Larry Haapanen holds a Ph.D from Washington State University, is an ex-Air Force Captain and retired college professor. "But if the transcript were edited to conceal links between the former Vice President and the murder, our conjectures seemed doomed by another exchange retained in the Newcomb transcript." KELLERMAN: I’ll have to call you back. Get a couple of men, rather the Volunteer (LBJ) boys to go over to his car and so forth. We’ll also need hers and several others. "The presidential limousine was a mobile murder scene. Its internal ravages – bullet holes, blood spray, embedded bullet fragments – would be crucial evidence in determining the source of the gunfire. If there was no controversy about the source of the shots, these speculations would be pointless. But so many things do conflict with the official notion of Oswald firing down from the Sixth Floor window; the Zapruder movie shows JFK thrown violently backward (toward Oswald); the shots seem to have come too fast for Oswald’s rifle; gunpowder odors are smelled in the motorcade; the Parkland doctors describe a frontal entrance wound, etc. Since there are few likely sources of shooting in Dealey Plaza which would not have ripped up the innards of the limousine, this car was obviously hot evidence. It will surprise no one that two larger fragments, with parts of copper jacketing still about them, were later matched to the rifle found on the sixth floor of the Texas School Book Depository, and which was later traced to Oswald. But it may surprise some that all were lying loose on the seats and floor of the car. Johnson apparently told no one of his bullet (no one on Air Force One seems to have heard about it) until he returned to the White House, and then both he and Chief Rowley broke the chain of evidence by not inscribing it, as standard police procedure. This is not the place to evaluate the controversy about the “single bullet theory” or CE399. But because LBJ’s “boys” were sent to “go over” the limousine, and because they found fragments of a copper-jacketed bullet, we should note that all ballistic evidence lining Oswald to the assassination passes through a single agency. Barely three weeks after the shooting, UPI found that the limousine had been quietly shipped to the Ford Motor Company in Dearborn, Michigan to be bullet-proofed and completely refitted. One wonders why LBJ – who so loved the status symbols of office – wanted to ride about in this same car with its bitter (or at least bittersweet) memories. If this was some macabre gesture of economy, it was most unfortunate since it prevented the Warren Commission from making its own examination and using the car in its filmed re-enactments. Only the bullet-scarred windshield (scarred with lead, not copper) was saved for the Commission 43 and there is both photographs and testimonial evidence to suggest it was not the same one that went to Dallas." "How does a bullet that is 3 cm in length create a hole that in 3 cm in length if not by entering fully sideon?" It was 1.5cm. It became 3cm after Dr Shaw trimmed the jagged edges of the wound. Mr. SPECTER - Will you describe Governor Connally's condition, Dr. Shaw, directing your attention first to the wound on his back? Dr. SHAW - When Governor Connally was examined,, it was found that there was a small wound of entrance, roughly elliptical in shape, and approximately a cm. and a half in its longest diameter, in the right posterior shoulder, which is medial to the fold of the axilla. "The wound that Olivier was asked to opine on was described to him as being 3 centimetres in its longest diameter. Whether 3 cm is accurate or not isn't relevant here. That's what Olivier was given to work with." Dr. Shaw testified the wound was 1.5cm. It became 3cm when he trimmed the jagged edges of the wound before closing it. Any conclusions reached using a 3cm measurement for the wound in JBC's back are wrong. "If Olivier had viewed what Sturdivan did, he would have been able to offer the same concrete opinion. The wound described by Dr. Shaw had to have been caused by a yawed bullet." This folks is called WC apologist logic. I'm guessing Mr Nickerson cut his teeth at the Flat Earth Society. So, Andrew was wrong to use Olivier in the way he did? OK.